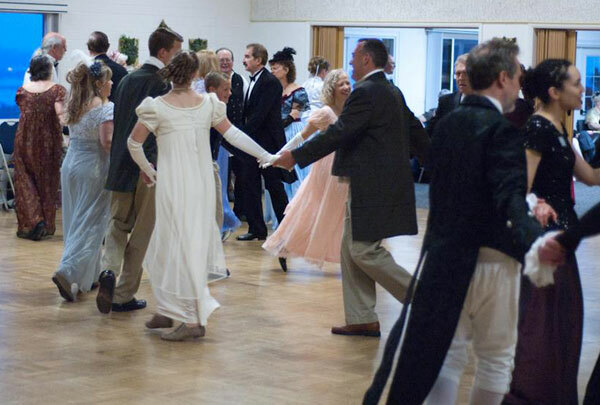 Here's some of our group at the 2012 May Faire Ball. Every Sunday Evening 6-9 pm. Sunday night rate is $8 per night for a regular class (local caller and recorded music). Paid SDECD members get a discounted rate of $6. Sunday night rate is $10 per night for live music and/or guest caller. Paid SDECD members get a discounted rate of $8. A dancer who arrives late to the Sunday night will still pay the full amount. College Students pay 1/2 the adult price. Our Beginner's Session starts promptly at 6 p.m. If it's your first time, or you need extra practice, please arrive at 6 p.m. because we always start with the easiest dances. At this time all the figures and patterns are taught, and all the dances are walked through several times before we dance them with the music. 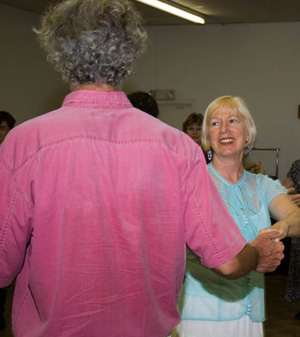 You'll learn heys, turn singles, casting, pousettes and more; experienced dancers are always available to help. Please wear comfy, low heeled shoes. Special discount for beginners: when you pay for your first dance with us, you will receive a coupon for your second dance free!